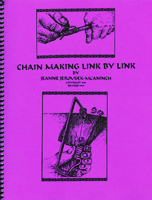 Chain Making Link by Link provides the versatility of a master index as well as chapter indexing and makes for easy accessibility to over 50 detailed and illustrated chain instructions, potential ideas for over 10 catches/claps to unique combinations with a variety of chain links (31) and to diverse segmentation. Soft cover, 8.5" x 11", 127 pages. 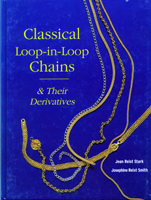 Classical Loop-in-Loop Chains is the ultimate resource for jewelers interested in the fabulous chains of ancient cultures. With clear instruction and foolproof illustrations, Jean Stark teaches dozens of variations on classic chains. Hard cover, 9" x 11/5", 190 pages. Imagine creating beautiful jewelry using only wire, jump rings, and a few basic tools. Beginners and experienced jewelry makers will appreciate the ingenious yet simple techniques used to braid, twist, and knit silver, copper, and brass wire. 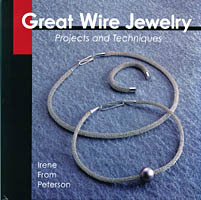 Great Wire Jewelry features more than 70 projects, each fully illustrated with color photographs and step-by-step diagrams. Each project is rated by difficulty; some of the designs are easy enough for children to do. There are patterns and styles certain to appeal to everyone! Hard cover, 8.5" x 8.5", 60 pages. Making Silver Chains walks the reader through the basic processes of silver working and presents a series of chain making projects in step-by-step format. Covered are trace chains, curb chains, the idiot's delight and other circular link chains, loop-in-loop chains, fancy link chains, and fasteners. 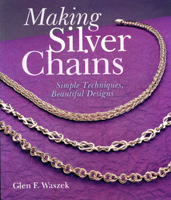 Simple techniques, beautiful designs, one of our best new books about chain making. Profusely illustrated with line drawings and color photographs, highly recommended for anyone with an interest in chain making. Soft cover, 8.5" x 10", 112 pages.